These spreads were an entry for the Society of Publication Design student competition. The requirements was to choose among five categories (Entertainment, City/Regional, How-To, Innovation, and Sports) and design two spreads for that specific topic. 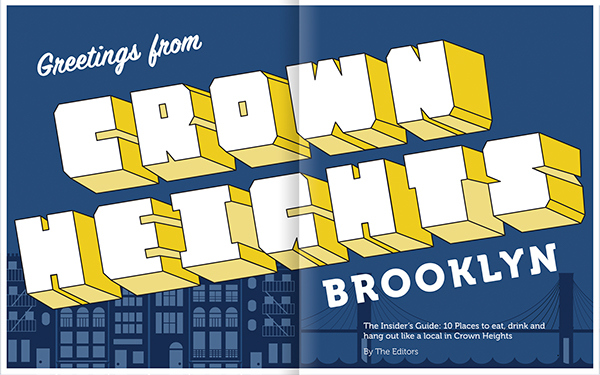 I selected City/Regional and showcased my neighborhood, Crown Heights. The spread had to round-up ideas and things to do such as night life, restaurant scene, and where to stay. 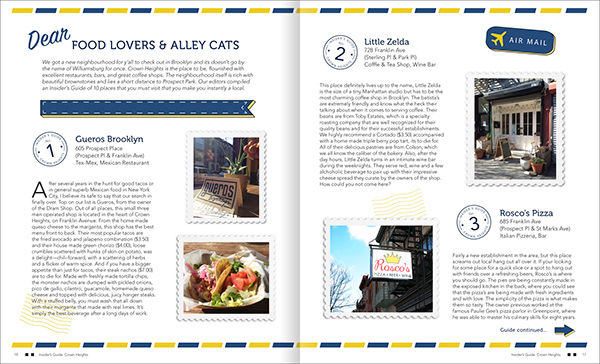 The given headline/dek was The Insider's Guide: 10 places to eat, drink and hang out like a local in (Name of City). These spreads were an entry for the Society of Publication Design student competition. The requirements was to choose among five categories (Entertainment, City/Regional, How-To, Innovation, and Sports) and design two spreads for that specific magazine.